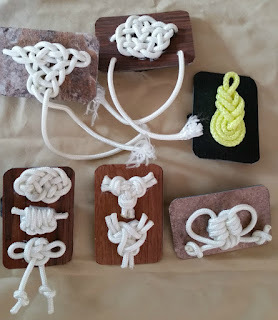 No its not an April Fools day joke, these are all knots I found in JD book and had lots of fun tying each of these miniature marvels. Using some nylon cord, I tied each of these using the instructions I found in the book. Next I either sealed the ends, using a lighter, or left them frayed. The mounts are Formica samples and the loops are nylon webbing fastened to the samples with pop rivets. I use a clear epoxy to mount the knots to the background.